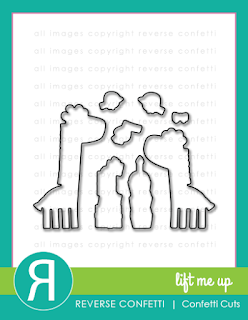 Well, it's that time again for another fun stamp and die release from REVERSE CONFETTI!! This release is all centered around our birthday month--Reverse Confetti is turning 3 years old! Hard to believe and what a fantastic journey it's been so far. Jen del Muro (owner and my best friend) is incredibly gifted in her vision, style and business sense for this company and I am so proud of her! Happy Birthday, Reverse Confetti! Today is Day One of our sneak peeks of 4 new stamp sets and 8 new Confetti Cuts, along with the latest Quick Card Panel set, PARTY TIME. My first peek is of the cutest giraffe stamp set I've ever laid eyes on! It's called LIFT ME UP and has coordinating LIFT ME UP Confetti Cuts to make your life easier to cut them out! The sweet giraffes (a parent and a baby/a big and a little one) have some accessories you can add to their necks and the birds that are included are perfect to add as a cute "buddy" to the giraffes. 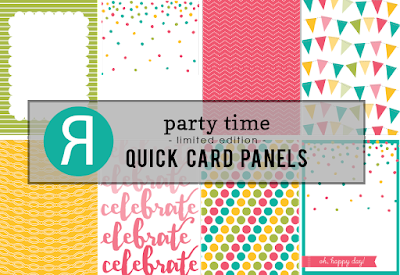 I used one of the new PARTY TIME Quick Card Panels as the basis for my card and also as "inspiration" on how to color my giraffe and his stack of cupcakes. I'm usually not a "soft" color palette kind of girl (I go for bright colors 90% of the time), but I really love how it makes my little giraffe stand out! Take a look at this set that could be for birthday, baby, or any kind of "it's your day" type of card! Ok, that's about all from me today! Come visit me again tomorrow! We have lots more sneak peeks to share over the next 2 days. Then, everything will be available on the 8th. Don't forget that Jen has a link list going daily (MAY 5-8) for all the sneak peeks over on the REVERSE CONFETTI blog HERE. Happy Birthday RC!! Your card is adorable. These little guys are so cute!! Can't wait for all the peeks!! Looking forward to more peeks....so cute!! Awww...super sweet card with the giraffe, bird, and cupcakes! Awesome inspiration! 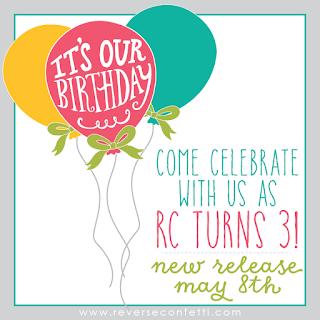 Happy 3rd birthday RC!!! Super cute! I love the non-traditional colors of the giraffe's spots. Everything is soooo cute, wanna love it! Cute card. Love the placement of the bird. 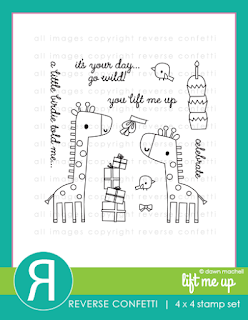 Great choices for coloring that adorable giraffe! Ooh fantastic design! Love the giraffes! Bright and beautiful colors/coloring.... a fantastically happy card! Lots of cute things in this release. Love all that you did with it. Love your bow and "stitched" edge. This is so adorable, Susan! So much fun!! Great card for kids!! this card makes me happy. i love how everything coordinates so seamlessly. Love the dotted background card. What a beautiful card and desidn and so colorful. Just lovely. Thank you for sharing your ideas. I love the layering and the colors of this card - so cute! Really love the layering on your sweet card. I really like all the colors in this card. It's so fun! This is a gorgeous birthday card! It's so fun and colorful! I love this new release! Adorable card! Love the quick card panels. Cute use of repeating polka dots...well done! Heeheehee This delightful card makes me happy!! Super, super cute! I love the layout! Cute all over! With those great colors, it sure looks like a party just for Reverse Confetti! So cute. Great card layout and love the colors and dots. Such a fun card - I think that quick panel is my favorite! Those cascading confetti dots just say party to me. So cute! It's so fun to see how all of y'all use the same stamp set in so many different ways. Such a cute card. Those giraffes are on my wishlist. How fun--I like all the polka dots. You put a lot of texture and visual interest in this card, I love it! It's so much fun! Beautiful card. Love all the layers! How awesome to be Jen's bestie!!! I love RC products....love the cute little animals...just love it all!!! Love the banner on your card!!! Love the colourful polka dots on the giraffe...cute card. Adorable card with fun coloring and details! Love that darling giraffe! Wow! Great sneak peek! I love the Giraffes and the card!!! Gosh Susan ... the party panel is perfect for your card. I love the layering and the design. Great job. Adorable card! Love this layout! this is just so well done i had to pin it for future reference.